The R&S® SFE is a multistandard capable broadcast signal generator that supports all common TV standards and a number of sound broadcasting standards. Whether analog or digital terrestrial TV, cable, satellite, and mobile TV, or digital sound broadcasting – all these signals can be modulated in realtime. For this purpose, the R&S® SFE combines a high-quality RF modulator, a universal realtime coder, and baseband signal sources in one instrument. Owing to its modular concept, the R&S® SFE can be optimally adapted to the requirements at hand – for example, with an integrated noise generator or a BER tester. And also after purchase the R&S® SFE can be quickly and easily expanded to include new modulation modes by installing software options. The versatile baseband signal sources for digital TV standards allow the generation of test signals from Rohde & Schwarz libraries as well as the replay of proprietary transport streams. 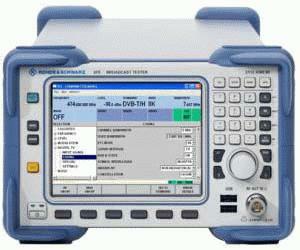 For analog TV, the R&S® SFE offers an integrated video/audio test signal generator. Alternatively, the user can feed transport streams as well as analog A/V signals from external baseband generators. Irrespective of the realtime coders used, it is possible to generate user-defined modulation signals by means of an optional arbitrary waveform generator and to replay waveform files of the customer. Although the R&S® SFE has a compact design and does not require much space, it offers the same convenient graphical user interface as the high-end R&S® SFU as well as extensive remote control functions.